The Freshest Styles and Ideas. As owner of La Bella Hair it is my mission to provide each and every client with the highest degree of customer service in a professional manner and unique setting. I offer a range of services and treatments. I will help you select the right style and treatments to make you look and feel great! I pay close attention to the details of your service and try to exceed your expectations by consistently bringing you the freshest styles and ideas, keeping up with current trends, and constantly educating myself. I make sure all my clients receive styles and services that are customized specifically for their lifestyle. La Bella Hair is proud to carry high quality hair care products that enhance the natural beauty of each clients hair. One ingredient changes everything… Color more frequently. Go Blonder. Push the envelope further without compromising the integrity of your hair. 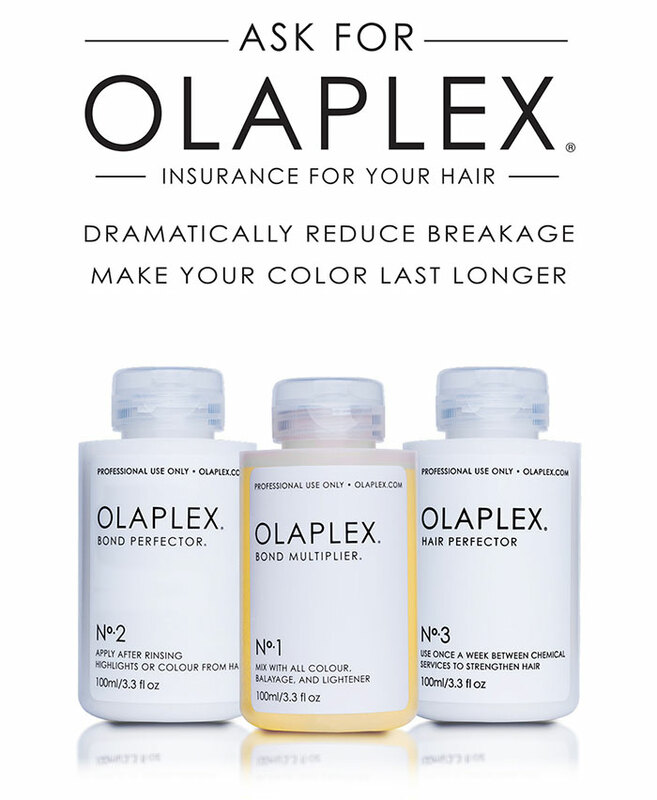 Olaplex is an add-on to your color service. It is scientific innovation that reverses and prevents damage to your hair that will make it stronger, healthier, and have longer lasting color results… It works on a molecular level to seek out broken bonds in the hair that are caused by chemical, thermal, and mechanical damage. It provides ultimate breakage insurance. The Bond Multiplier rebuilds broken disulfide sulfur bonds and begins the process of preventing damage and repairing the hair. The Bond Perfector continues to rebuild and restore any remaining broken bonds ensuring the strongest, shiniest, and healthiest hair possible. Olaplex is free of silicone, sulfates, phthalates, DEA, aldehydes and is never tested on animals. It is suitable for all hair types and textures of colored hair. Brazilian Blowout is the only smoothing treatment that can be customized to keep curls and lose frizz or achieve the sleekest result possible. It significantly reduces drying and styling time, locks in color, adds shine, and improves the overall condition of the hair for up to 12 weeks. This treatment has zero down time. You can leave the salon and immediately wash your hair, exercise, swim, and use a clip or ponytail without worry or having to wait days to do so. I recently moved here from California, and after having the same stylist for 15 years, I was very nervous to go somewhere new. Jen was my stylist and I could not be happier. I have a LOT of hair but that did not intimidate her as it has others in the past. She did an amazing job with a cut (left the perfect amount of hair) and layering. Her blow dry left me feeling like a model, and to top it off, she is so sweet and helpful. I have found my new stylist and salon :). Skill. Style. Sensitivity. These three words perfectly describe Jen LeBlanc. I followed her from a salon in Lexington and would follow her anywhere. She has the SKILL to cut, color, and design hair that fits the person; the STYLE to make you look fabulous; and the SENSITIVITY to listen and understand how you want to look and feel about your hair. That said, she will also GENTLY guide you in a direction that might work better. I always love how I look and feel after a visit to Jen and the compliments always follow! Jen LeBlanc is nothing short of amazing. She started cutting my hair several years ago and then I moved to Virginia. I now fly back from Virginia twice a year to get my hair cut. I am not kidding, she is that good!! The best part is, I only get my hair cut the 2 times a year that I fly back to see Jen and I will literally get compliments about my haircut 5 months after she cuts it. You HAVE to try her. Jen is the best! No one can cut hair like her..NO ONE! Her blonde is always perfect, her color technique, her foiling..I could go on and on..her talent is undeniable! As a client for many years I highly recommend her, you most certainly be asked by many who did your hair! Jen is a true artist! I am so blessed to have followed Jen from her former salon. She is a true artist with my hair and is the only one I feel comfortable trusting my hair to. I have used her for over 11 years and her skills only improve. Jen is an amazing stylist and a wonderful person! Under her guidance, this is the best my hair has ever been! I LOVE the cut and the color. I’ve been so happy with all her suggestions. I trust her completely. Love Jen! She took extra time to discuss the plans I have for my hair in the long run and what I’m looking for now. The cut and style are exactly what I wanted! I’ll be back again and again! Jen is THE best!!! She always amazes me with her work/knowledge. It’s always an enjoyable experience simply talking with her, and I am always happy with the finished product. Go see her! Gift cards are available in a dollar amount or for a specific service or package. Redeemable at La Bella Hair only. Applicable towards products or services only. Gift Cards do not expire and are non-refundable. La Bella Hair requires all clients to have a valid credit card on file. By reserving an appointment you are accepting the terms and conditions of the cancellation policy. Canceling or any rescheduling of your appointment with less than 24 hour notice will result in a 50% charge of the reserved service amount. No-shows will be charged 100% of the reserved service amount.